Looking for the perfect candidate is hard, but it can also be tedious. To mine for the best talent, you have to bookmarking sites, copy & paste profiles, and try to keep track of everyone and every opening. Wouldn't you rather be interviewing? 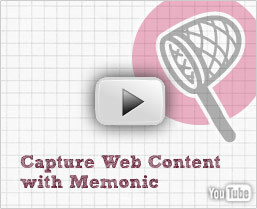 With Memonic, save any web content - with just a click - to your own online notebook. Organize research into folders, or with tags. Your clipped notes are stored in an online archive for easy editing. You can also integrate our clipper with your own recruitment tool, and drop your web clippings right in. Contact us to learn more. Memonic helps you get more people great jobs.